VR is a medium that’s quickly becoming a new creative outlet. 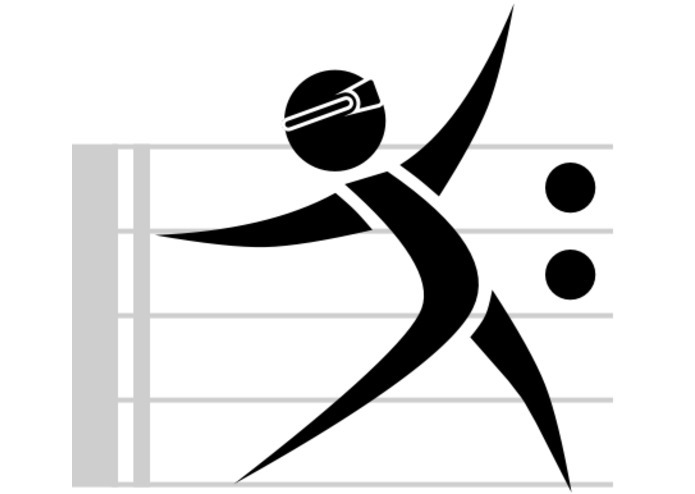 We believe it is a way of making music based on natural movements, without relying on existing instrument interfaces. The level of immersion can unlock latent musical abilities in new users, or extend the abilities of existing musicians. 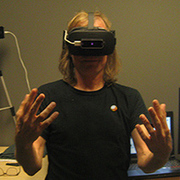 Phillip proposed a general goal of creating a unique VR-centric music tool. Our initial analogue was a theremin, but in VR. 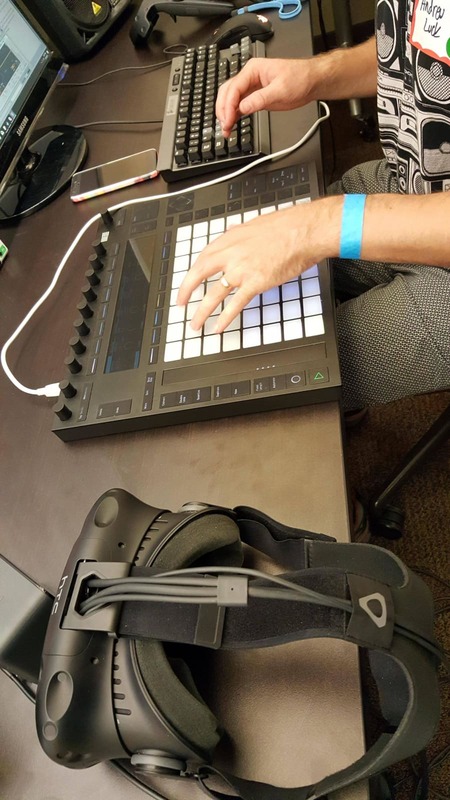 The team has many musicians and individuals enthusiastic for novel expression in VR. Currently many other music or sonic manipulation apps rely heavily on skeuomorphic principles. Our design question was: How could we build a musical instrument that could not be realized outside VR? Philosophy We built Vox Augmento to enable both novice and experienced musical enthusiasts to express their musicality. The barrier to entry is low but the instrument’s full expressive capability will need practice and mastery just like a real instrument. 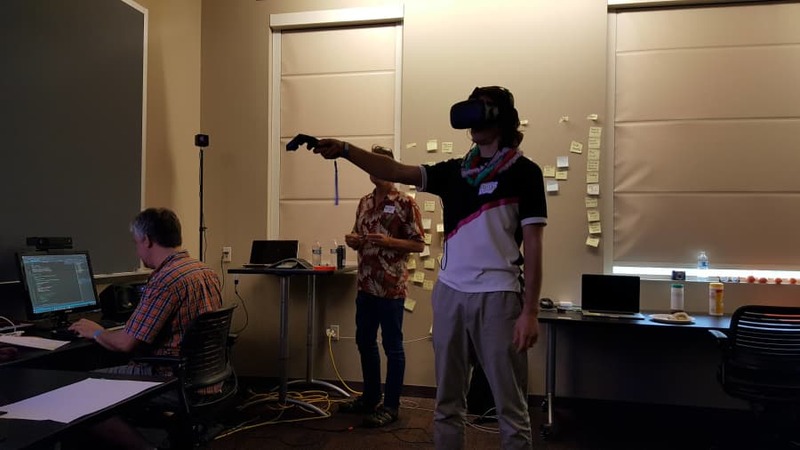 Visual understanding Users want to revisit their actions in VR space, know that what they do exists in space. Experimentation and discovery Finger painting is wonderful. Playing, creating, and destroying is important to the user. Even during initial testing, unexpected expressive usages were discovered. By purposely minimizing menus and modes, a user is more free to try things for themselves. Mastery Novices in music can often feel that an instrument is daunting and be discouraged. The mode of expression should allow for both novices and experts to create amazing experiences. The instrument makes its limits and functions easily discoverable. Users who want to achieve mastery to express themselves in more fluid ways are encouraged. Journey MVP A user can paint what they speak as if placing a waveform in air. Moving the controller higher raises pitch, lowers the controller lowers the pitch. Colliding with the painted waveform will replay the sound. 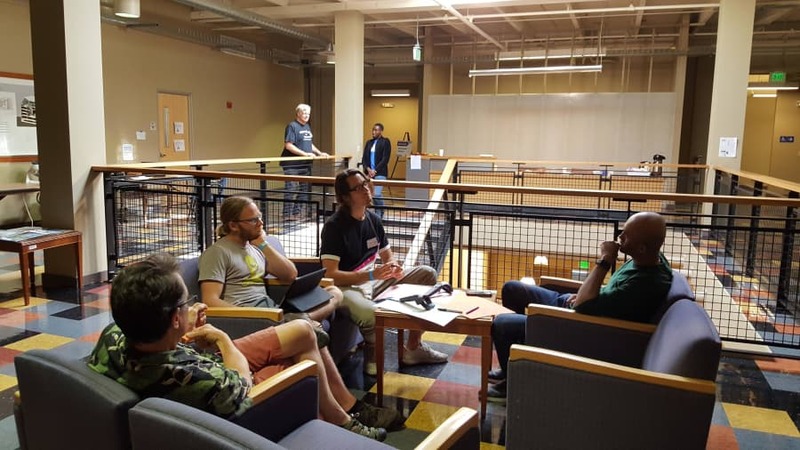 Discovery Team members discussed concepts of how sound and music interact within VR space. Quickly working through how people of different experience levels try to make music. Then asked how to best represent interaction with sounds or music. What does the X, Y, Z access mean to the creation process? Initial analogs to real world editing were demonstrated using Abelton. This let the entire team understand basic concepts of editing quick sound samples. A key insight was that not all users were musically literate. Would it be possible to use this VR as a medium to unlock a new world of creativity. The team determined which qualities overlapped between different experiences, and how to guide novices to mastery without being overwhelming. Design Assets were created in Tilt Brush, Blocks, and Maya. We conducted quick surveys asking what comes to mind when trying to make a sound loop. This revealed several answers, many responses involved drawing a circular loop to represent make a sound play over-and-over. Another response was to let any sound loop, this would be achieved by selecting the sound for a select amount of time. For ease MVP, a menu system or multi tap would allow loop mechanic to work. 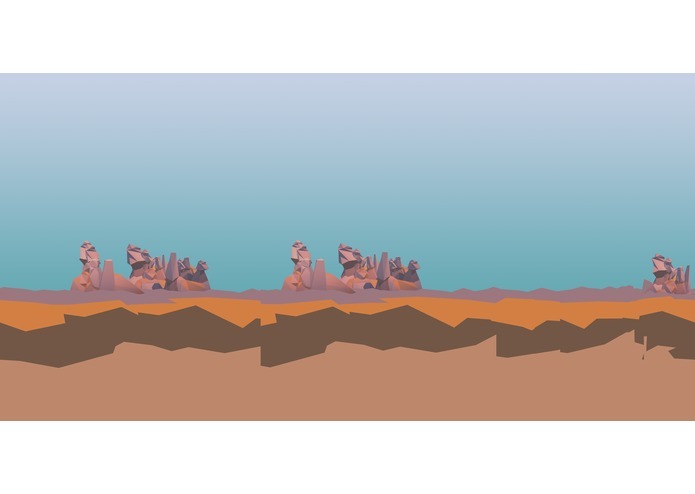 Visuals Setting - Users are on a rock landscape platform. Burning man on the cliff. Controller - A bone musical wand is used to represent an ancient paint brush. A light trail flows the tip. Output - White sound bubbles are generated from the controller to represent record sound. First steps - Realtime link between Unity and Max. Get data about controller and collisions into the audio engine. Crucial to get this step to work, otherwise new platform would need to be chosen. Audio cleanup, looping, multi controller ideas were non-crucial and backlogged as nice to have. These were not accomplished during the initial build. Persona There was a man who like to sing. This man liked to dance. One day he wanted to dance to sing! This man may not have been musically literate, but with VR he would more quickly move up to proficiency. 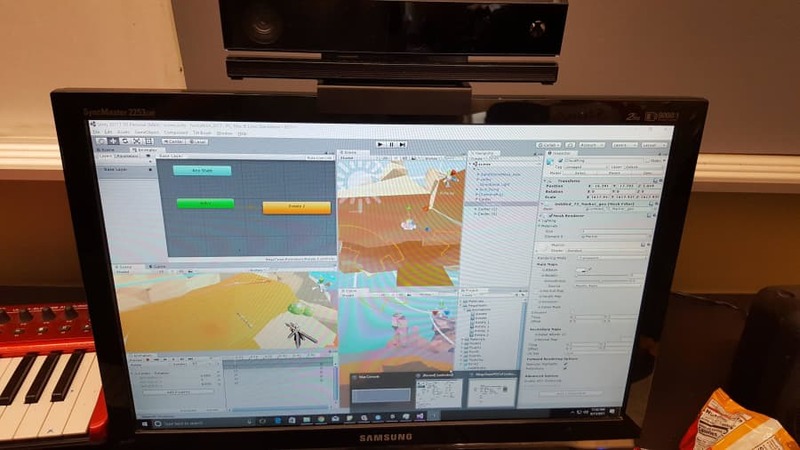 Basic Mechanic Users using the headset microphone and controller paint sounds they make into the VR environment. The shape of the painting alters/modulates the sound. The painted sounds can be interacted with to re-play them. Painting sounds into a circular loop will let the painted sound loop over and over. Advanced control over the sounds in VR space. This includes editing the sounds, replacing, looping, and duplicating. Granular control will allow for more complex expression, ever increasing the range for users who try to achieve mastery. Users are handed one controller with little instruction beyond the intent of the app. The goal of the user interaction is about discovery. The usage and discovery is not something the developers would be able to ever fully predict. The demo may even evoke new usages and practices not envisioned. I pitched the project idea, helped design the interactions, and built the audio engine in Max/MSP. My role was developing quick proofs of concept and preliminary technology and package choices. I set up the networking on the Max side and laid out the infrastructure for the real-time synthesis / fx in Max, after patching the foundation of the audio engine. During the design stage I steered the team in a direction where we could take advantage of VR's strengths and create an expressive instrument that was untraditional. 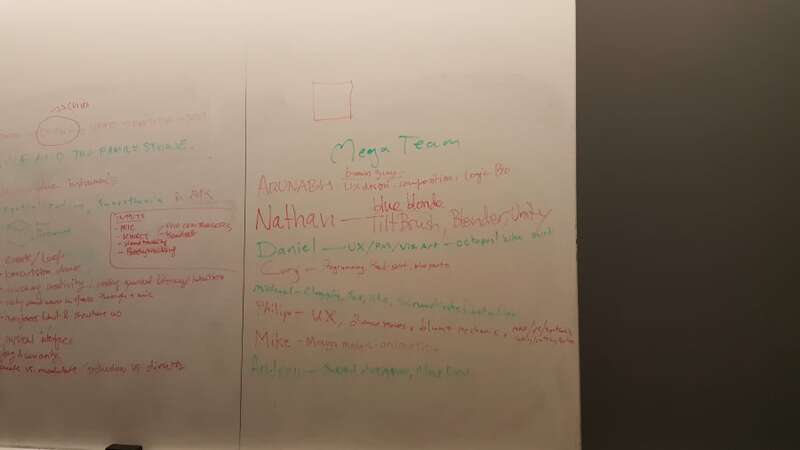 I worked on the design plan with the team, including basic ideation, defining the problem/end user, interactions along different axes, logo design, one art asset, testing, and demoing the program to users. Product designer. Supported concept development, distillation into prioritized reqs. Hacked functional prototype to prioritize MVP interactions. Led user demos. * People - Team formation, facilitator, servant leader. * Process - Task definition and prioritization and tracking. * Platform - Early ideation. Interaction model definition (sonic, body/somatic, trasform). Demo design. I directed the location idea and built the environment assets in Blocks and Tiltbrush. 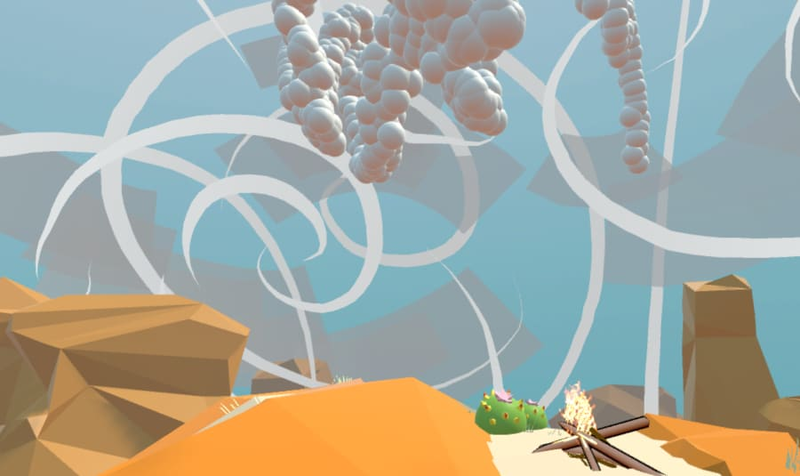 The skybox was quickly realized from snapshots taken in Tiltbrush. I produced the Unity code, integration of visual assets into Unity, created a UDP OSC data channel to the Max audio editing software and created some Unity animations. I helped work through conceptual ideas, testing, and doing the writeup.